I've been buying Salmon Trout by the whole from Giant lately and decided to bake a Salmon Baked Rice today, inspired by the baked rice I did previously. The hubby and I loved it! I guess this recipe is here to stay! Essentially, this recipe is made up of a fried rice, canned soup, salmon and cheese. The fried rice can be cooked with whatever you fancy, or whatever you have in your kitchen. Just add in whatever tickles your fancy. This recipe yield 2-3 portions or even 4 (if you're small eaters) and it takes about 1.5 to 2 hours in all to whip up, of which most of the time you're just waiting for it to cook. I'd rate it a difficulty level 2 out of 5. 2. In a frying pan, heat up about 2 tbsp oil on high heat. 3. Add garlic and fry till lightly browned. 4. Add onion and fry till lightly browned. 5. Add in sausages and fry for about a minute. 6. Add mushroom and fry for about a minute. 7. Add broccoli, red and yellow capsicum and fry for about a minute. Season with some salt. 8. Add rice and fry for about a minute. 9. Scoop rice into rice cooker and add water. I reduced the amount of water to 3/4 cup (from about 1 cup) as I had lots of veggies in the dish. 10. Cook as per normal rice in the rice cooker. 11. Scoop into baking dish. Spread cherry tomatoes at random. 12. Scoop canned soup onto rice and spread evenly. 13. 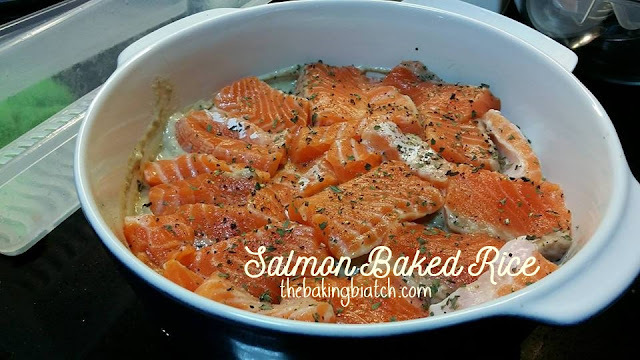 Spread salmon that has been washed and sliced onto the sauce. Sprinkle some dried basil and black pepper onto the salmon. 15. Bake in preheated oven of 200 degree Celsius for 18 - 20 minutes or till dish is browned and bubbly. Enjoy!